The passionate Ahmedabad-based artist’s four-decade-long visual journey has left citizens of the city completely enthralled. Check out how the veteran painter’s love for birds manifests, in this comprehensive retrospective. If Mahendra Kadia hadn’t been an artist, he would’ve surely pursued ornithology as his career. For four decades, the artist has been exploring his love for birds through the canvas. 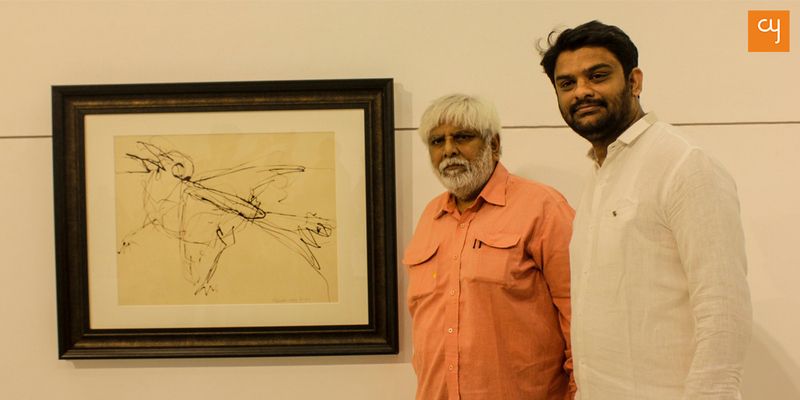 It is this deep affection toward his feathered subject that is being showcased at the show Mahendra Kadia – A Retrospective – Lines to Strokes. 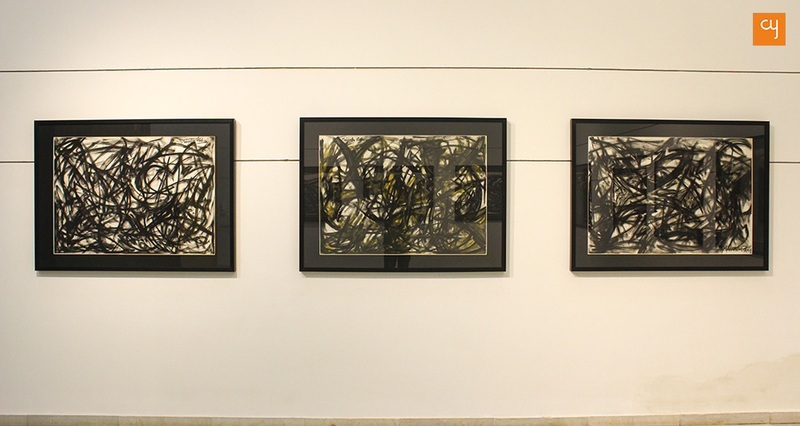 The artist’s methodology, elements and aesthetics have evolved dramatically over time, necessitating that the three crucial eras of his life – traversed by his 103 paintings – be segregated across three different galleries in Ahmedabad. And mind you, this massive collection of 103 artworks comprises only the masterworks of Mahendra Kadia, far short of his entire oeuvre. Strolling through the artist’s life story, one discovers how significant a role the city played, as a catalyst, in the making of the great expressionist. Birds take on myriad forms, employ different mediums and adorn various kinds of paper, as testament to Kadia’s energy and his ever-changing moods of passion. A struggling student in his early days, Kadia was sent to study art at Sheth CN College of Fine Arts after his matriculation. As no one else in his family hailed from a background in art, his high school Principal Himmatbhai Kapasi introduced him to veteran artist and sculptor Piraji Sagara. Sagara used to spend lot of quality time in the basement at CEPT University, painting. As a prodigy, Kadia was deeply inspired by Sagara’s work. On his suggestion, he diverted his focus from drawing birds to sketching fishes, for a few years. Although the marvellous bird artworks, which defines this Retrospective, are unquestionably beguiling in their formations, I feel that Kadia’s paintings of fish are equally remarkable. They possess strikingly bold colour combinations and a palpitating kinetic energy about them. The aura of the overall show would have, no doubt, only been augmented had the fish series also been included in it. During Kadia’s Early Era, from 1977 to 2000, he drew birds in great detail before backdrops of landscapes, trees, clouds and sun. 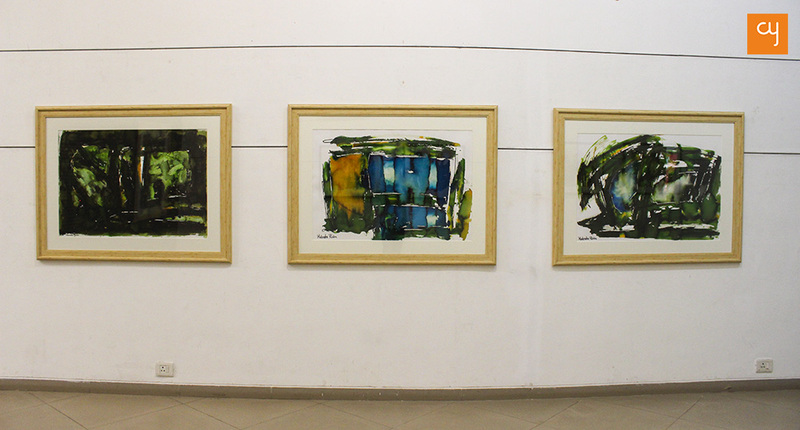 The series painted during his visits to Mt. Abu, while he was still starting off as a fine artist, is a testament of his intricate skill and surrealist inclination. However the large part of this era, and the display is defined by his famous Birds. These are realistic presentations of the feathered subject, composed in contrasting colours and varied formations. The open beak, across all the paintings, to me, signifies the artists own urge to find a footing in the visual arts space. These are utterly in contrast to his later works. These 48 artworks of birds, which are displayed at Amdavad Ni Gufa‘s Herwitz Gallery, are so charming and captivating that my mind automatically started recollecting personal encounters with birds. The Early Era takes you on a dreamlike tour. 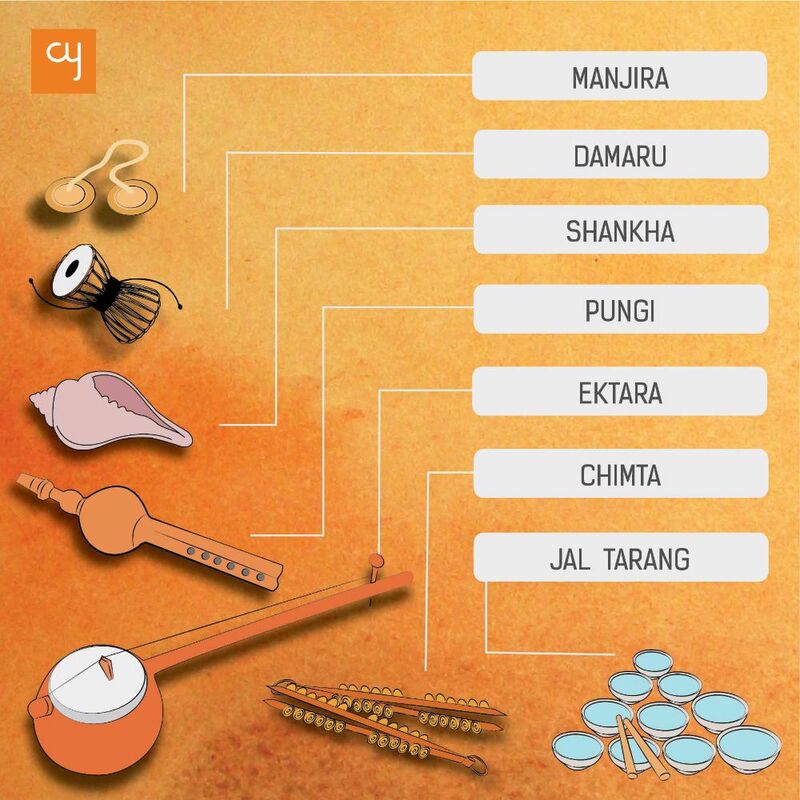 One would have loved to hear the tranquil warbling and chirping tunes, in the background, an aural experiment that the dynamic curator may try out. 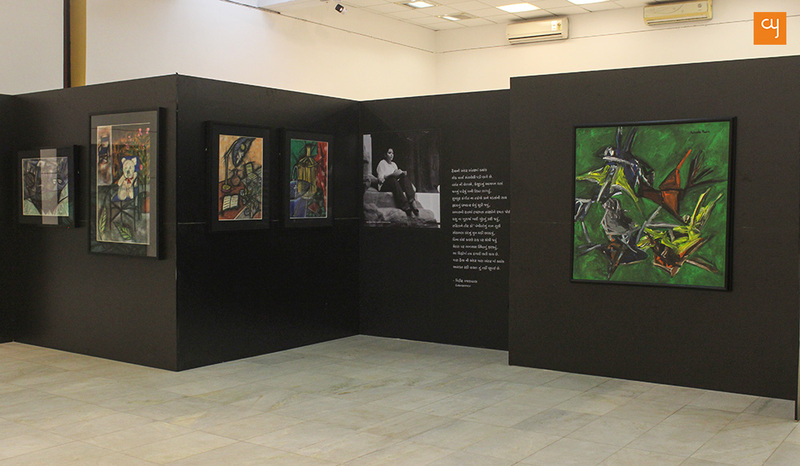 If you have visited the iconic Amdavad ni Gufa art gallery prior to this, you will be amazed to see how curator Giriraj Kadia has transformed the ambience of the gallery through wooden partitions, so as to create a walkthrough of Mahendra Kadia’s life. The journey begins with two of Kadia’s smallest and most magnificent works on display. His initial line drawings, which were sketched in the early days when he visited the bus stand and Railway Station to practise his lines on paper, depict his punctuality towards art; how painstakingly he tried to understand the anatomy of a literal form. In his early era, Kadia exhaustively used the kitta technique. This methodology was developed in a particular ‘eureka’ moment, one day when he saw a Jalebi vendor pouring batter into a frying pan without letting the pouring instrument touch the oil. Employing this technique, he sprinkled paint onto canvas, without letting his brush touch the paper. Looking at Kadia’s kitta painting reminds one of the objets d’art of American abstract expressionist Jackson Pollock, who practised the same technique of drip painting. 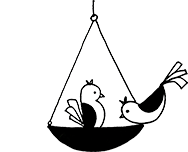 Kadia’s lines, however, are controlled and eventually yield figures of birds. 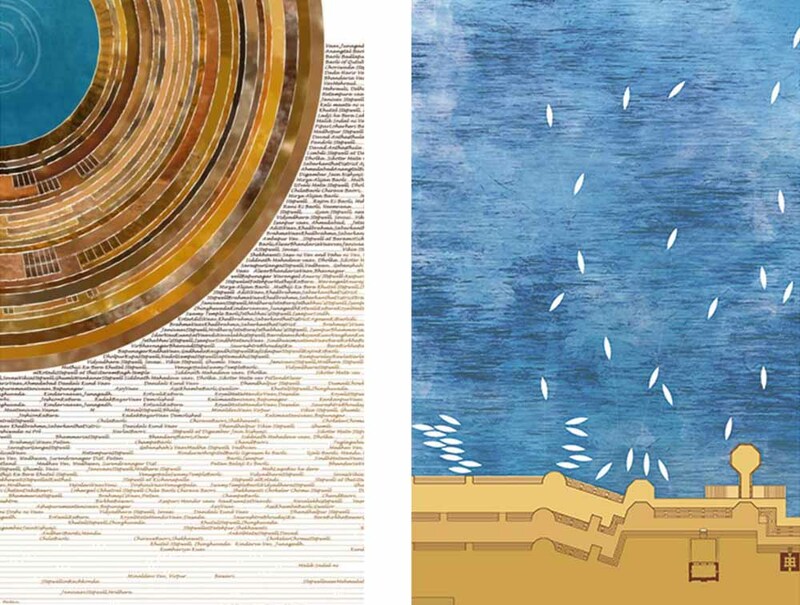 Before the conclusion of the Early Era, the artworks already begin to hint at what one will witness in the second chapter at Hutheesing Visual Art Centre – a possible fluttering matrix, an evolution from ‘lines to strokes’. The Evolution chapter of Mahendra Kadia’s retrospective narrates Kadia’s decade-long transitional voyage from 2001 to 2011, through 33 paintings. Heavy and sharp strokes of paint adorn humongous canvases, in a style that isn’t evident at all in the first phase of the exhibition. They seem to portray a mindful commotion, almost building up to a cadence. These perspectives of Kadia – on the fluttering motion of birds – are vastly impactful on the viewer. 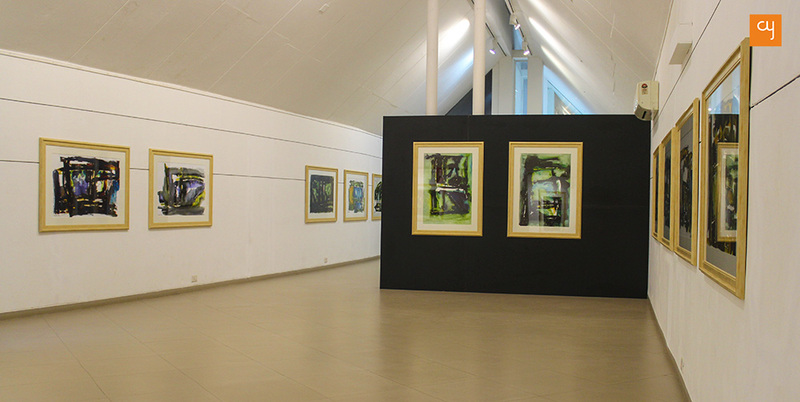 And this part of the exhibition portrays an expansion in his composition skills. The four still-life paintings that are displayed in this section were created during a particularly poignant period in Kadia’s life, at a time when he was mourning over the loss of his daughter. The paintings manifest an unconditional silence and a feeling of desolation. I was personally moved upon seeing a photo of Kadia’s young daughter beside the artworks, who, incidentally, also wanted to become a painter like her father. The final epitome of Kadia’s visual journey so far is open for all connoisseurs and art-lovers to witness at The Liberation chapter in Kanoria Centre for Arts. The phase between 2012 and 2017 liquefies Kadia’s birds into sheer energies. 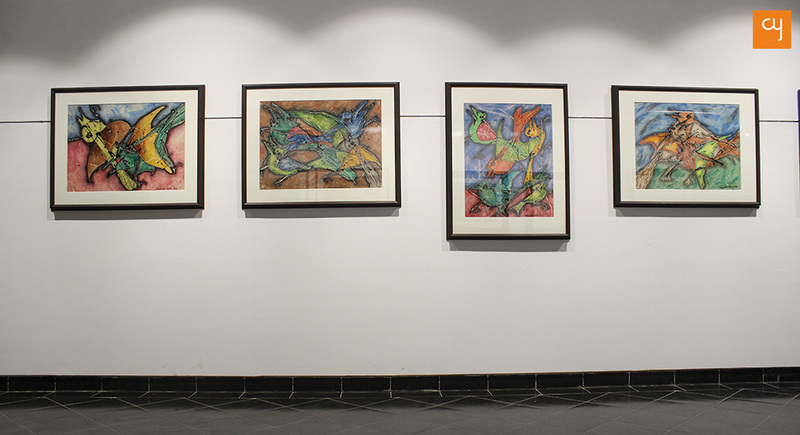 The 22 paintings at the gallery seem to be synonymous with the word ‘freedom’, as the beaks, wings, flutters, legs and eyes of the birds seem to leave their active form and surrender to become colourful patterns. The aura of the bird is so vivid that, even when they aren’t physically recognizable, one can magically hear their chirping. At least I seemed to hear them. Wandering towards the end of the show, you might contemplate the philosophy of the artist, wondering why he chose birds as his primary subject. Perhaps the free flight of these birds, the sense of liberty in their minds expressed through their wings, and perhaps their blamelessness – perhaps these were the qualities that Kadia wanted to achieve, as an artist, as he sought to break out from the fixed ‘form’ barrier of his subject. There are some things that money can’t buy. A passion for achieving excellence is undoubtedly one of them. 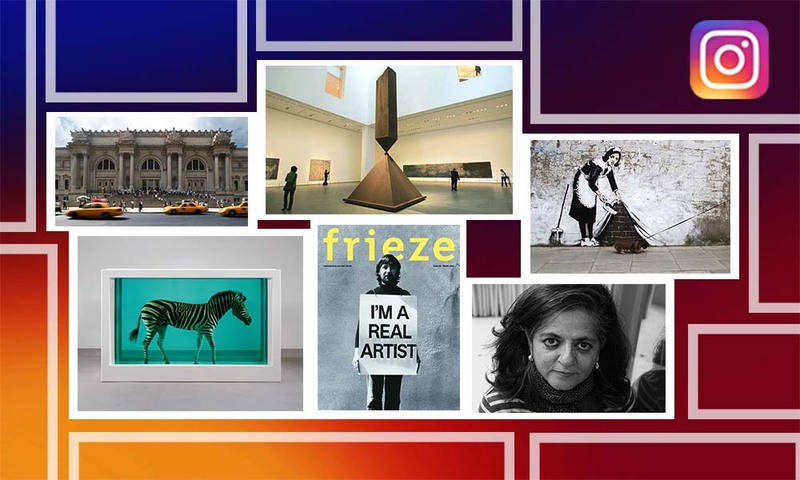 We thank Giriraj Kadia for setting up such an excellent show about an artist who has inspired generations to follow their passion for the visual arts. 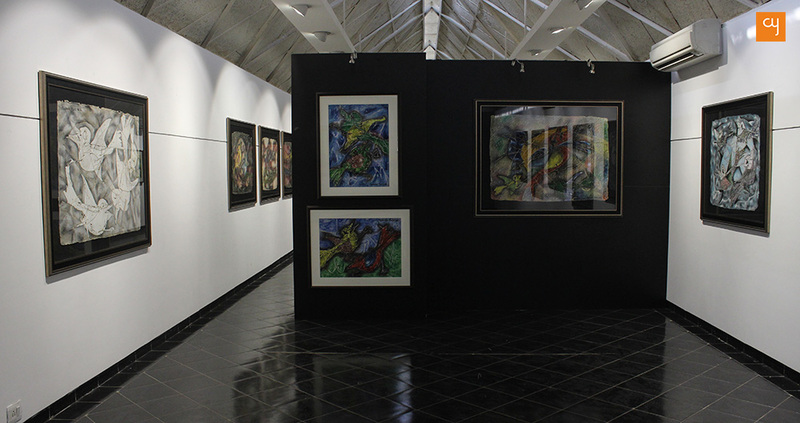 Incidentally, Giriraj Kadia hasn’t left a single stone unturned to engage the city with the Retrospective. His strategic promotions through digital and traditional mediums garnered rightful attention. Smt Dakshaben Hutheesing inaugurated the exhibition on January 10 and the show is open for audiences until January 21, 2018.